This past weekend, I hit up Michaels and found a whole bunch of packs of 3x4 journaling cards from the Recollections line. I couldn't resist them, and settled on buying just 5 packs. They were on sale for $2.50 (for a 50 pack!). The one thing that bothered me is that you couldn't see all the cards in the pack, so I took pictures of each one and thought I'd post for you, so you can see before you buy! How cute are these?! I love the birthday ones, I think they'd be awesome on a greeting card, or even attached to a gift package. 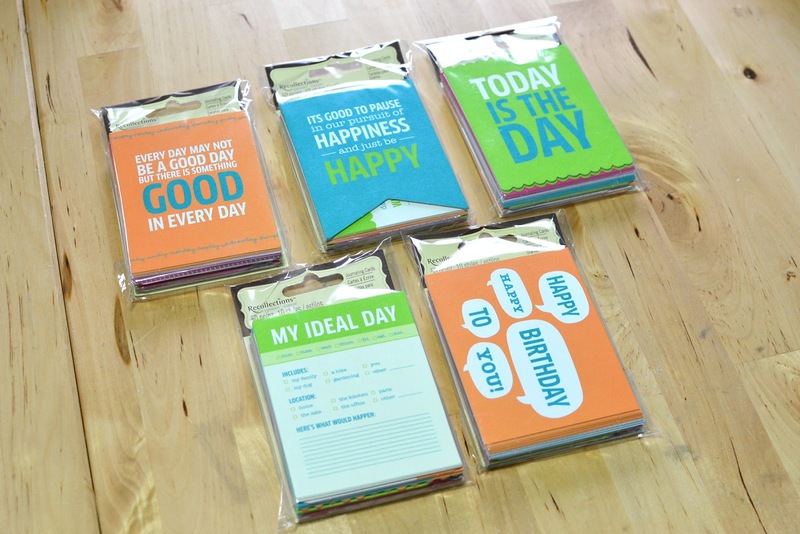 Now, the journaling cards come 50 in a pack - 5 each of 10 designs. There's no way I'll use them all, so I am giving away one of each of the 50 cards to one lucky reader. Leave a comment on this blog telling me which card in the photos above is your very favorite, and you'll be entered into the giveaway. Winner will receive a set of 50 different journaling cards from the Recollections collection - one of each that you see pictured above. Entries close Sunday, March 3, 2013, at midnight EST. Be sure to check the blog on Monday, March 4, when I'll post the winner. I'll need your name and address so please make sure to check the blog or subscribe by email so you see the post revealing the winner! These are really fantastic! I'm going to have to keep a better eye out when I next run into Michaels. Love the My Perfect Day and Birthday Wishes cards. Wow I never saw these. Great post. I like the "I AM" checklist card. 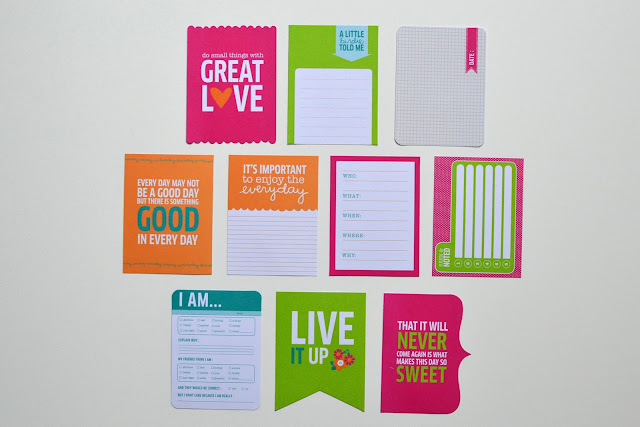 My favorite is the pink "do small things with great love" card. These are all adorable! But I love these! The colors make me so happy! Those are so darn cute. I love the bright pink "I'm so happy you were born" tag. I love them all! I had no idea Michaels carried these!! I love the "little things" set but it was hard to pick! Thanks!!! I really love the card, "That it will never come again is what makes this day so sweet." I like that because my 3 year old is growing up so darn fast and many days are hectic and chaotic, but I'm desperately trying to appreciate even the hard days because I'll never get them back. Thanks for showing these. They are super fun! These are so cute!! I also like the birthday cards best. My favorite is the "I'm So Happy You Were Born" card. Love it!! I say that to my girls all the time. Thanks for the opportunity to win these. Love your blog - great inspiration here!! So hard to choose! Fave would be "Best Day Ever." Or "Live it Up." Or "Today is the Day" (and now I've got that praise song in my head...) They're all fabulous! Thanks for the generous give-away! I am so going to go check those out! The birthday ones are my fave! Thanks for the chance! I like the cards that you get to check the boxes. 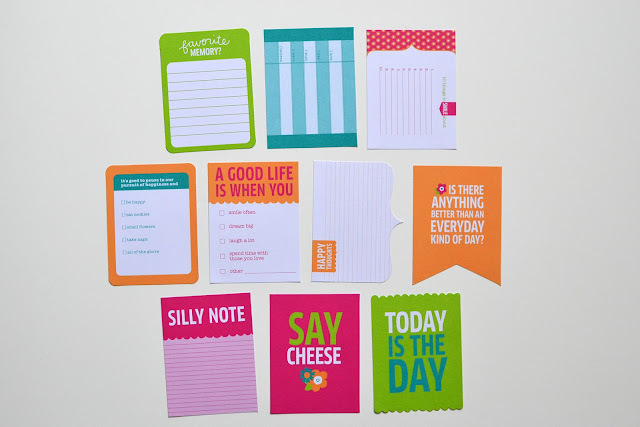 I especially like the "A Good Life is When..." card. Those cards remind me of the Knock Knock brand. So fun! Oh, this is soooo hard to choose! I guess my favorite is the silly note one because my kids and nieces and nephews are always saying such funny things! Thank you very much for the chance! I think I like the one that says, "Every day may not be a good day, but there is something good in every day." I think it is not a comment that is expressed enough. I like "It's all the little moments that make life a BIG adventure". Now I'm going to have to go to Michael's- I had no idea they had anything like this. Thanks for the chance to win! I love the Birthday cards! My sons birthday is on Monday and would be perftect addition to my PL album!! Gosh, didn't know Michaels had these - gonna have to check it out. Thanks for sharing the cards in the sets. I had seen these but wondered about the ones inside. 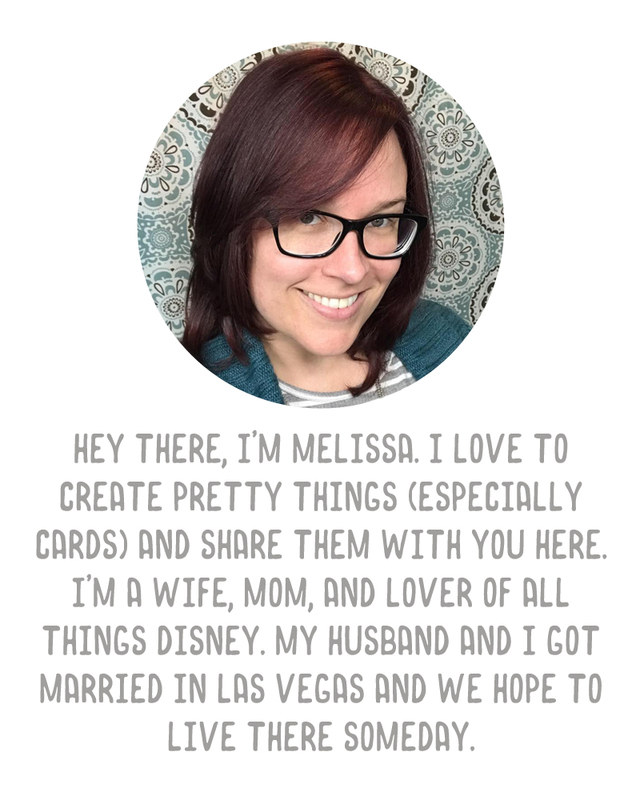 I love the cards with the "fancy" cut edge (scallop, banner bottom, etc.). And the birthday cards are cute. Fun things to document in PL. This is how the story goes is my fave! Such a fun giveaway - thanks!! I just love these!!! 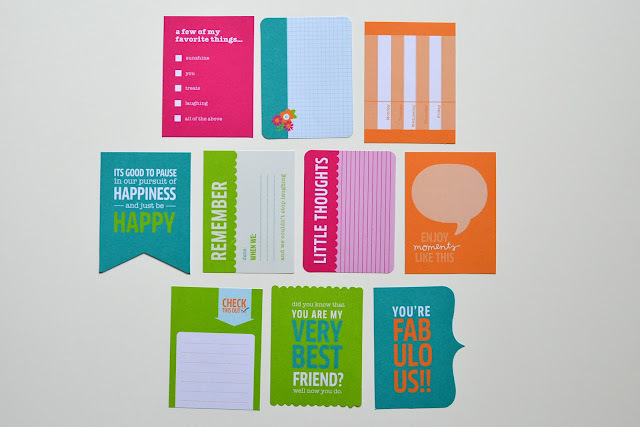 Getting going in project life, this would help me out a great deal to win these :) Also love the bright colors! 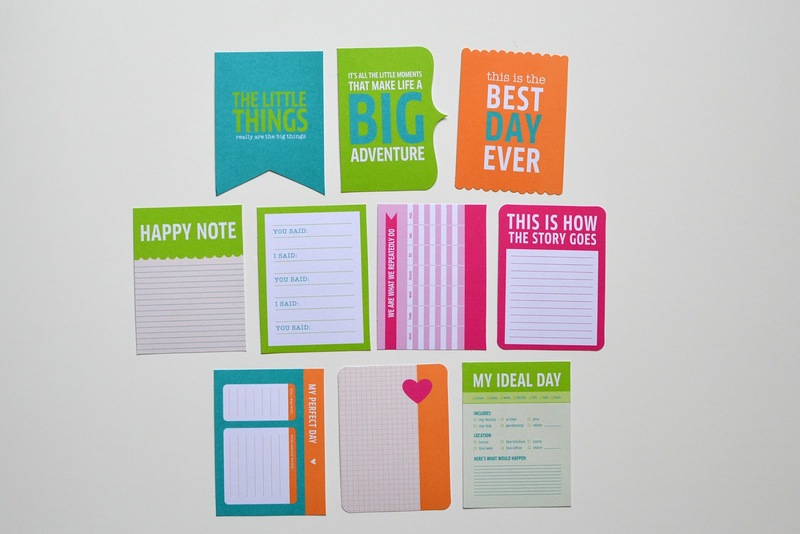 That it will never come again is what makes this day so sweet is such an awesome saying for any scrapbooking page. Love all the journal cards. Thanks. I love the " glad you were born " card. I like the You're Fabulous card. Love all of them and their bright colors -but think I like the Live it Up set the most! I may have to go pick myself up one and not wait until I win!!! Love them all, but especially the Birthday Wishes! My daughter just turned 2, and I'm attempting project life this year. These would be perfect! I too will have to check if they have these at my Michaels! WOW! Seriously I wish there was a Michaels close, I love all of them. My favorite ones are the little check off cards. Thanks for the chance for these great cards. I like the birthday cards also. Thanks for posting these pictures--very sweet of you! My favorite card is the "I'm so happy you were born" Thanks for the giveaway! OMGosh I didn't even know Michaels sold journal cards! How could I have not known? I'm so addicted to them! Now I desperately want to go out and see for myself! I love them all, such happy colors and quotes! My favorite has to be the Silly Note. I think we are not silly enough and take things too serious ;-) More silly notes will be a god start! I want the best day ever cards! Oh my, now I need to make a pilgrimage to Michaels to see if my store has any! I love the 'I'm so happy that you were born' card, what a wonderful sentiment!! I like the birthday checklist card, but if I win I would want the prize to go to my bestie Andrea in VA. they look fun cards Melissa. All of these cards are so pretty! I especially love the card that reads "that it will never come again is what makes this day so sweet." Thank you for the chance to win =). Those are great! I will have to look for those next time. I saw some recollections stuff last trip to michaels but don't think I saw those. Thanks for sharing the designs. Today is your Birthday and I wanted to say... The Birthday set would be great since my daughter turns 10 on 3/3. Love the "I'm so happy you were born:)" card!!! thanks for the chance!! Man I wish I knew Michaels had journaling cards too. I was right by Michael's today;) Thanks for the heads up! wow it's a great deal !!!! I dont live in US, what a shame !! Yeah, sorry about that! Shipping rates went up recently for international shipments big time! I ♥ ♥ ♥ the one that says "Happy Birthday" w/ the flowers. What a fabulous set of cards, THANK you for the opportunity to win a complete set. And I'm with you ... I like to see ALL the contents of a package. My favorite is the orange card saying "Is there anything better than an everyday kind of day?". These are so cute. I love the sentiment about this day will never come again. I like the one that says..."this is how the story goes". Wouldn't it be fun to get several family members to tell about one event from THEIR point of view? First pic, 1st teal banner on the second row; love that sentiment! thanks for the giveaway! I really like the "It's Important to enjoy the everyday" with the journaling underneath. I do a lot of everyday moments, and that one is great. Those are super cute! My favorite would have to be the one that says, "Every day may not be a good day, but there is something good in every day." - This goes along with my 365 project I'm doing this year, in which my goal was to capture a moment worth remembering each day. PS- thanks for sharing, that's kind. Looks like I'll be checking out Michael's soon! I love the pink "I'm so happy you were born" card. Perfect for the birthday celebrations we'll be having this weekend for my 4 year old! 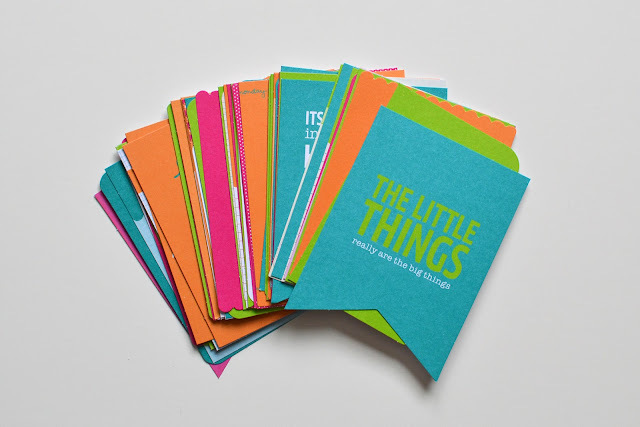 Love all of them especially "the little things are the big things" card. Wow! How cute are those? Thanks for sharing. Michael's here I come. Love the "Happy Birthday" card! They are all great though! I Love these! My friend had these at a retreat and was using them in her Disney Album (PL style). I think I like the "Say Cheese" the best, b/c my kiddo's are ALWAYS saying that when we take their picture. Thanks for the chance to win! What great cards. Love the one that says today is the day. I like the second set that has the little things card on it, I think they would be awesome in on some of my vacation layouts. Thanks! 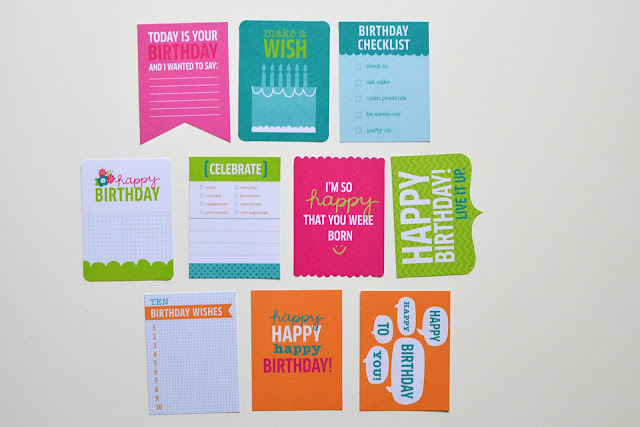 I love all the bday cards @ the pink happy note card, so cute! I love, love, love the card that talks about how not everyday is not a great day, but you can find something great in each day. This goes along with my OLW for 2013 - Intentional. I like the one that says "Enjoy moments like these." I love the "it's important to enjoy the everyday." Thanks for the giveaway.